Is that time of the year again, when we fill our yards and houses with ghosts, witches and creepy crawlies for some reason that would take more than one sociology essay to explain. We’re not here to do that, but what we can do is help you decide on the best decorations for your yard. What to buy is an increasingly hard choice to make, as the number of available options increases year by year, but we hope you’ll find something to your liking from our selection of cool products. If you want a lot of bang (or booh!) 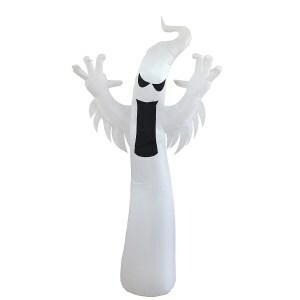 for your buck then you’ll be hard-pressed to find something better than this inflatable ghost. It wasn’t made with any fancy material or by employing some skilled craftsmanship because it’s just an inflatable balloon in the shape of a ghost. But don’t let that fool you, the effect it gives at night is impressive. When lit up by a lantern from inside, the balloon’s textures resembles something out of Poltergeist and it’s bound to draw the attention of each passerby. Furthermore, it offers the convenience of a balloon, meaning you can deflate after use for easy storage. It’s safe to say that aliens don’t get that much attention as Halloween props, and we can’t really tell why, as this “life-sized” realistic looking figure from Halloween FX really lives an impression. 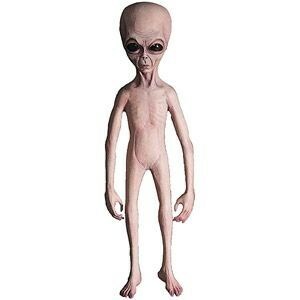 It’s a classic gray alien figure, the type you see in shows like The X-Files and abduction stories documentaries, that’s filled with hard foam and stands at 4.5 ft tall (stand not included). 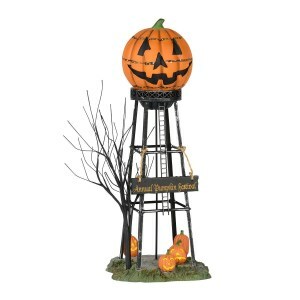 People who bought it say that it holds pretty well to the elements and can be used for many years in a row, which is just as well, since this realistic looking figure is not particularly cheap compared to your usual Halloween knick-knacks. We return to the classics with a bag of spooky looking bones. 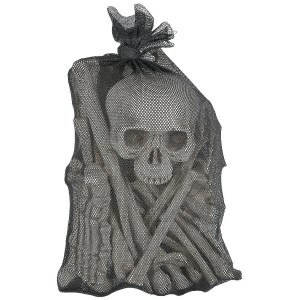 In a mesh sack — that can also be used for display purposes — you’ll get 28 bones of various sizes, from 6” to 12”. Among them there’s a skull, a femur, hands, feet, and a pelvic bone, all made of hollow plastic but close-to-life enough to be used as realistic Halloween decorations. They are a little smaller than what you’ll find in anatomy museums, however, so they will look best as part of a larger graveyard ensemble, where they’re just one out of many points of interest. 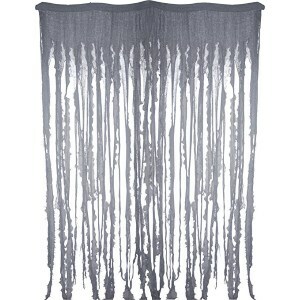 No spooky mansion will be complete without some tattered-looking curtains. This 74 x 96 inches tattered looking rag will be just the thing to hang over doorways or window frames, and it’s cheap enough to be used in bulk for an adequate effect, although you’ll only get one single piece per pack. People who’ve bought it comment that it feels pretty substantial, and it’s not just a flimsy piece of cloth that can be taken away by the first gash of wind. Heck, if you’re a grandma intent on scaring the neighborhood kids you might just use this on a regular basis! This is a giant spider web explicitly designed for the front yard. Not that it couldn’t be used in interior spaces, but flimsier pieces of decor might do an equally good job under these less demanding circumstances. The pre-tied radial strings are sturdy enough for outdoor use and the five metal stakes used to attach it should stick well to the ground. Cotton wool is distributed over the strings to give it a creepy-er look, and this can be easily replaced with common pharmacy-bought wool once it wears out. This web should hold well for multiple years, although it comes cheap enough to justify a one-time use. If you already own other models from the Department 56 Halloween Village, then this piece is definitely a must-have. After all, few old-timey towns will be complete without a water tower, especially ones big enough to have a train station, like the Department 56 diorama. It’s resin-made, with a nice paint job and a good amount of detail, and at 11” tall it is eye-catching enough to serve as a set piece all on its own if you want something to decorate your desk with. The model also contains a wiry tree and a couple of Jack-o-lanterns. Maybe you’ll need something to pair up with the spider web we covered above! 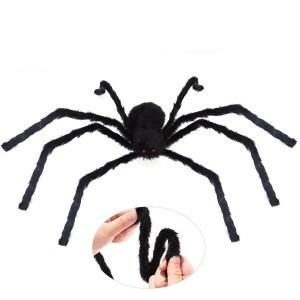 Sturdy enough for outdoor use, this giant, 50” spider might do the job, especially if you’re into cartoony-looking Halloween decorations. Powered by 3 AA batteries, it can do a series of effects for jump scares and creepy feelings. The glowing red eyes shine brighter from time to time, and when struck, the spider will shake and make weird noises. This last bit makes it important for it to be placed on a stable platform, which you can easily do thanks to the wiry legs, which will bend to fit it. Inflatable ghosts are well and good, but what about a see-through specter to hang from trees or porches? This piece from Partypeople does just that, with a sheet of thin black or white fabric coupled with a creepy-looking skeletal mask. Although how cool it will actually look, depends on your own skills as a decorator, the fabric material will fold very easily, to give the impression of substance and the mask is damn right striking on its black background. 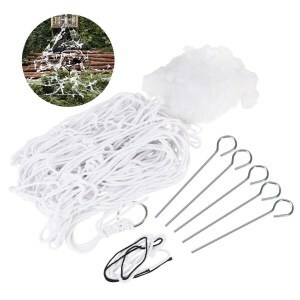 This product is suitable for both indoor and outdoor use and easy enough to install by using some string. 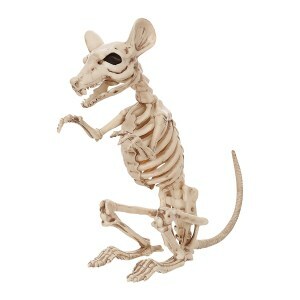 This little rat might be only 11.5 inches tall, but it’s definitely tough enough to handle the outside, as it’s made of durable plastic and the bones are a little thicker than on an actual rat skeleton. However, thanks to its good amount of detail it gives the impression of realism, and it’s nice looking enough to warrant being sold as a collectible item, together with a bird, cat, spider skeleton, etc. from the same manufacturer. The tail, head, and jaw are flexible, so you can give it an expression, but its little paws and legs are stuck in place, which is more a feature than a bug, since action figures are notoriously hard to balance. 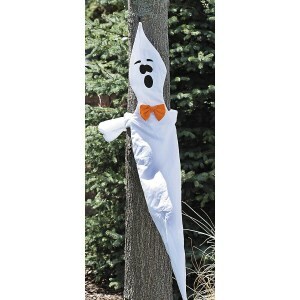 If you have an appropriately thin tree in your yard (with only 46” inches in length the canvas might not fit larger trunks), this fun ghost will make a fine addition to your Halloween decorations. While marketed for trees, it can be mounted on just about any place that allows for a piece of cloth to be wrapped around it, and the ghost itself will keep its shape thanks to an integrated wireframing. The fabric is strong enough to be left outside for a couple of days, where it will be a cute presence, with its exaggerated “boo” expression and pumpkin-orange bow tie. 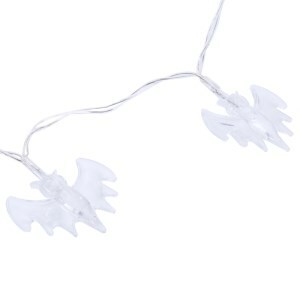 Halloween ensembles can be made significantly more interesting with the proper use of lighting and these string lights in the shape of blue bats are sure to increase your options. People who employed them noticed that they are extremely bright, which will make them suitable for outdoor use, where they will compete with other light sources. You shouldn’t worry about running a cable to your front yard because the 20 LEDs, making this string up run on battery power, and you’ll only need 3 AA batteries to keep them on 8 hours a day for a full week. Although Halloween isn’t for a few months, people who love this holiday start preparing way ahead to make sure everything looks spooky on the creepiest night of the year. There are numerous people who consider Halloween as one of the most profitable and imported holidays in the world, so it comes as no surprise that some stores sell year-round Halloween accessories and decorations. However, as much as we would want to spend our entire monthly check on Casper decorations and skeletons, for most of us Halloween comes at the end of a paycheck, meaning there isn’t too much money left to actually celebrate it. 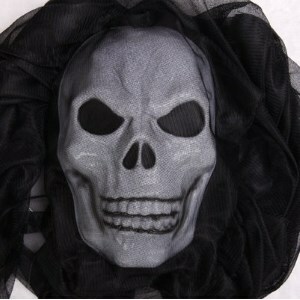 Nevertheless, the online stores and supermarkets offer a wide array of affordable decorations and accessories to create frightening sets for Halloween. If you’re not yet sure what to buy and how to make sure you took the best deal, our comprehensive shopping guide will teach you how to make all this. Below you will find a full guide on how to make the most out of your holiday shopping without having to break your piggy bank or ask for a loan. 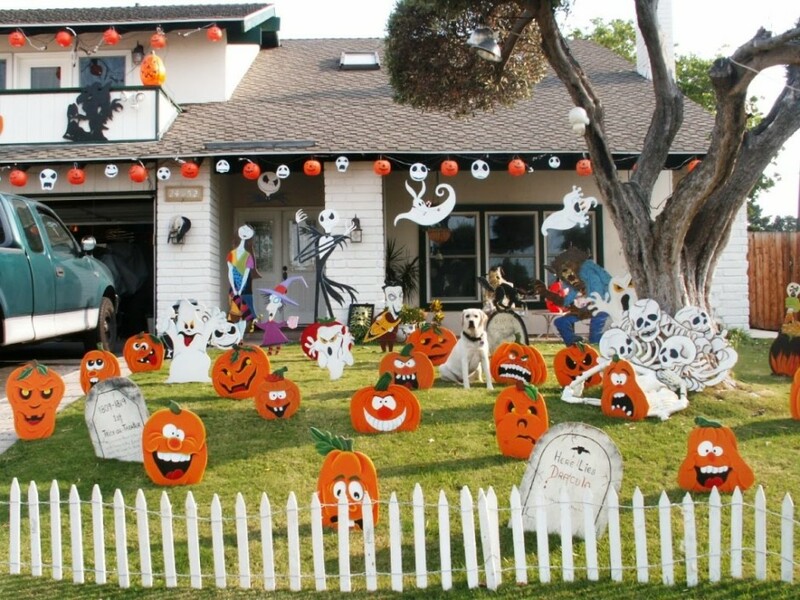 Moreover, you will get a hint on the most outstanding Halloween yard decorations to make sure your house will be the spookiest and most appreciated in the neighborhood. Although numerous stores offer cool Halloween decorations, sometimes you can stick to a minimum budget and create the maximum effect by taking what nature has already provided. Halloween is celebrated at the peak of autumn, bringing in fruitful crops and beautiful gold and fiery leaves. So why not take advantage of everything nature is offering you and create unique and beautiful Halloween decorations? With the minimum investment and some cool ideas, you can turn your yard into a fancy story decor, ready for the trick or treat guests. Purchase one-two dozen squashes or jacks and carve them carefully for your future Jack-O’-lanterns. You can do the same with zucchinis and eggplants for a fresh look. Add in a consistent amount of fake spider web and you will be ready for the holiday in no time! If you want to give your yard a more traditional, autumn look, you can decorate the alleys with fallen leafs and seasonal flowers. Those who want to make sure they will win the prize for the creepiest porch can align the carved pumpkins on the front porch to watch everyone who wants to cross-path your house. We guarantee you will be left with plenty of candies as no one will dare enter your home! As we previously mentioned, you don’t have to spend a fortune to make the most out of the following Halloween. With some accessible materials and lots of imagination, your DIY projects will be ready in no time to be hung around the house and the yard to spook anyone. Buy some black paper or the cheapest black fabric you can find and cut pieces of it shaped like bats. Add hooks or strings for easy hanging and decorate your entire house, both on the inside and on the outside. You can even use some of the bats to place near the carved pumpkins and, with just a touch of a fake web, your yard decors will be perfect. Haycocks can be used in countless ways, especially with carved pumpkins. And, if you really want to go over the hook and create a truly inspirational Halloween setting, simply paint half of your front porch with black dye. Attach numerous candles and play some spooky noises in the background. If black and orange aren’t really your colors and you’re more into a glamorous type of Halloween, we suggest ditching the regular decorations and replace them with white ones. 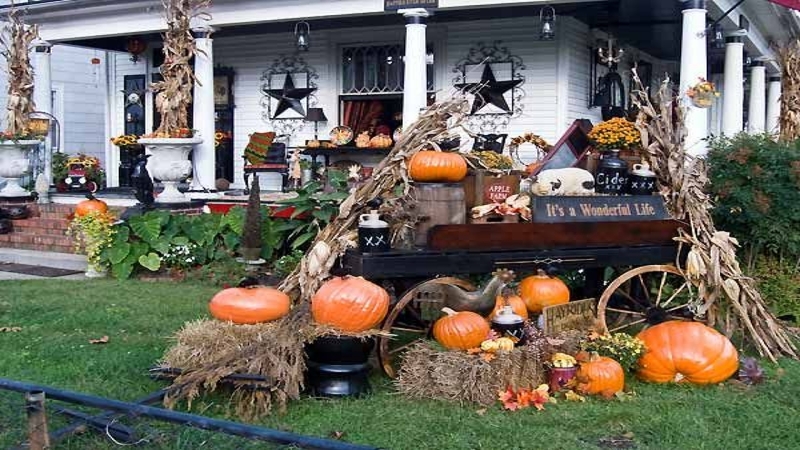 White Halloween decorations are elegant and exclusivist, giving a touch of lavish to your porch. Purchase white squashes or pumpkins and carve them in spooky faces, then light them up with regular candles or LED lights. Complete the setting with white flowers and some white outdoor lamps. They will make a wonderful and elegant composition next to the rusty fallen leaves and colorful trees. If everything else fails or you simply lack the DIY skills, you can always purchase some efficient Halloween decorations. However, to make sure you don’t pay your entire salary for a bag full of kitschy items, you need to know exactly when to buy. Just like any other holiday, Halloween is seasonal, meaning all accessories and decorations destined to this day will be sold for higher prices before the feast. The entire month of October is marked by the magical night of the Halloween, so we suggest doing your shopping earlier. This way you will also get your hands on the most desired items. However, the best time of the year to purchase these items is right after the holiday. You may find it strange at the beginning, but the next day, big retailers and online shops offer huge discounts just to get rid of their extra stocks. It happens with all large holidays, including Christmas, Thanksgiving, and Easter. Thus, to make the most out of your money you have to think smart and prepare in time. This may roughly translate in waiting one year until buying the next Halloween decorations but you do have to make some sacrifices if you want to keep your budget intact. Pumpkins are, without a doubt, the stars of this feast, meaning you can get to exploit them as much as you want. If this celebration will cost you more than you originally planned, there is one delicious way to get at least some of your money back. Now, we all know everyone’s crazy about the pumpkin spices and flavors during this time of the year. So why not take advantage of it pretty easy by posting a coffee stand in front of your yard? You can sell your own cups of coffee for a profitable price by just buying a few pumpkin spice toppings or syrups. We guarantee this will make you score an important amount of cash in no time.